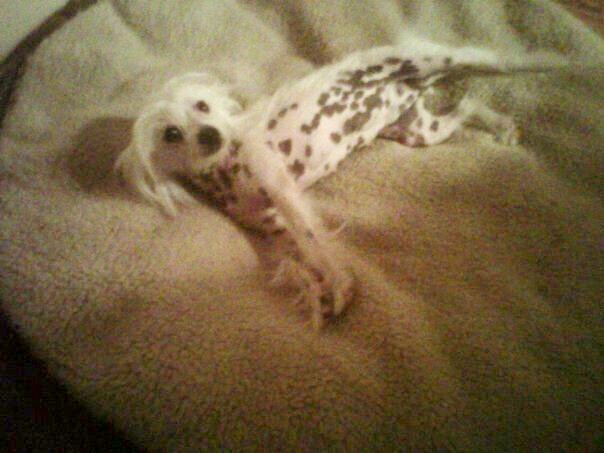 The exact origin of the Chinese Crested remains somewhat of a mystery but Geneticists have designated it as Canis Africanis, which is very possibly correct for no hairless dog could exist in the wild and would not evolve in a cold climate. Something caused a gene to mutate and so the first hairless dogs appeared from their coated parents. Hairless dogs have always been rare and would have originally been regarded as curiosities and highly prized for trading purposes. From this it is believed that the Chinese Crested have evolved from African hairless terrier dogs that were acquired by the Chinese and reduced in size. At one time it was known as the Chinese Ship Dog since Chinese sailors often took the breed along on voyages to hunt down shipboard vermin. Pups were often traded with merchants in port cities and even today the breed can be found in ancient port cities around the world. Spanish explorers found the Chinese Crested Dogs in <?<span>Mexico and parts of Central South America as early as the 1500s. The breed was also found in Africa and Asia in the 1700s and 1800s. They first appeared in European paintings and prints in the mid-19th century. They first appeared at American dog shows in the late 1800s.Another theory is that the Chinese Crested Dog actually developed with the Aztecs by breeding the Mexican Hairless with the <?<st1:State w:st="on">Chihuahua. It is believed that the Aztecs actually used these dogs as companion dogs but also as bedwarmers in the cold months. These dogs may have also been used for human consumption at special events in the Aztec calendar. Regardless of the exact lineage the Chinese Crested Dog is certainly a unique and different type of dog that has attracted a specific type of dog lover throughout its history. The Chinese Crested is one of those hairless breeds that have survived and is becoming increasingly popular all over the world. In all hairless breeds, except the American Hairless Terrier, coated brothers and sisters appear and it is impossible to breed just hairless as, even after five generations of hairless to hairless matings, it remains possible for a complete litter of coated puppies to be born to hairless parents. In the 1800's the breed became known in Europe and North America, specifically the United States. It did not become a recognized breed by the American Kennel Club until 1991 but is steadily increasing in popularity among rare dog breed fanciers. TODAY… The breed was recognized by the Canadian Kennel Club in 1992, and by the American Kennel Club in 1991 after the first American breed club was established in 1979. 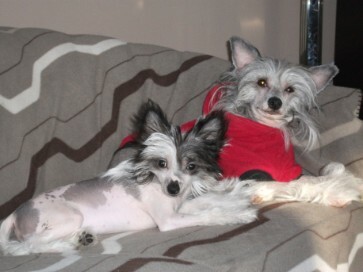 The Chinese Crested is considered as part of the rare breed category. The Chinese Crested was officially recognized by the Fédération Cynologique Internationale in 1987, by The Kennel Club (UK) in 1981, and by the Australian National Kennel Council in 1995. The Crested is a very adaptable breed and will adjust to all type of living arrangements. Since they are not typically barkers by nature this makes them good candidates for apartment living on the condition they are allowed to exercise, even if that happens to be indoors. This very affectionate and playful breed has the advantage of being clean, have very little doggie odour and generally less likely to produce allergic reactions. Additional benefits of this breed is that flees cannot attach themselves since the hairless variety does not offer place for flees to hide. They are playful, charming and lovable little dogs that can make very entertaining companions for adults and children who are taught to be respectful and gentle with the Crested since they can get injured if exposed to roughhousing. This intelligent breed enjoys companionship and will become very attached to their owners. So if you are unable to be with your dog for longer periods of time if might be a good idea to have two Cresteds so that they may keep each other company. The Hairless allele (the wild type) is a dominant (and homozygous prenatal lethal) trait, while the Powder Puff allele acts as a simple recessive trait in its presence. Zygotes that receive two copies of the Hairless allele will never develop into puppies. Thus all Chinese Cresteds carry at least one copy of the Powder Puff allele. The Powder Puff trait cannot be bred out because it is carried by all Chinese Cresteds (even the hairless ones). 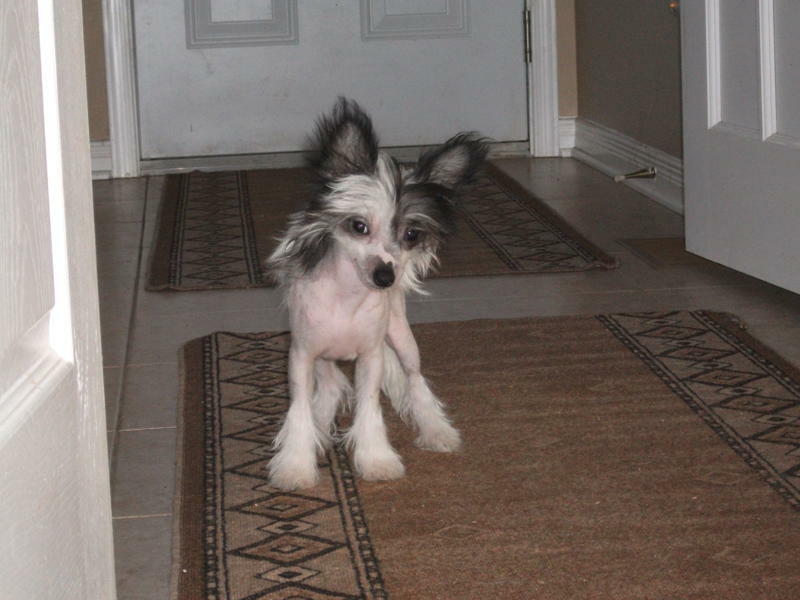 All Hairless Chinese Crested have the ability to produce Powder Puff puppies, even when they are bred to another Hairless. On the other hand, Powder Puff bred to another Powder Puff can never produce hairless puppies, since they do not carry the Hairless gene. 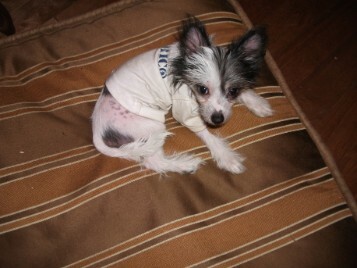 The Chinese Crested has a life expectancy of about 12 to 15 years and if well cared for can live longer. They are considered to be a healthy breed, but they can be prone to certain conditions associated with the mouth, eyes and knees to name a few. The Cresteds have what is called a "primitive mouth", which means that most of their teeth are pointy like their canines. Hairless varieties can be prone to poor dentition, which may include missing or crowded teeth. Missing teeth, in particular, are so commonly found in the Hairless Chinese Crested dog that the breed standards do not penalize as a fault in the confirmation shows. Their teeth can also be prone to decay when not properly cared for. Most dogs of the Powder Puff variety have few, if any, dental defects and according to the standard would be faulted for missing teeth, whereas the Hairless variety would not be penalized for absence of full dentition. The Chinese Crested Dog is prone to weight gain if inactive or overfed, so finding a way to keep your Chinese Crested Dog active is important. They do enjoy outdoor walks and are good on the leash once properly socialized and acclimatized to being in new environments and places.